I have a Tablet Weaving workshop coming up, and I need to make a warp for each of the participants. It would be great if we could all make our own, but 4 balls of yarn, times 10 participants – plus me is 44 balls of yarn rolling around the floor, and I can only assist one participant at a time. So we’ll all make one warp together to get a feel for it, then everyone will have a warp prepared to learn the weaving technique. Normally when I create a warp, I place four bowls on the floor and drop a ball of yarn in each – this sort of works. 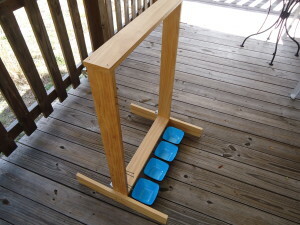 I know it would be easier with a warp rack, so the yarn would feed smoothly from the source, and it would be leading from around the same height of my hands. With so many warps to prepare I decided to make myself a makeshift warp rack. I don’t have the room for a lot of equipment with only one purpose, so I’m modifying one of my smaller Navajo looms that I made into a dual purpose tool. Screwing in cup hooks for the yarn to feed. I made this small Navajo loom about four years ago when I learned Navajo style weaving. I placed nails in the back to also use it for a warping frame, so adding the function of warping rack will give it a third function. I have some bowls that I never use for eating, but they have a super smooth glaze, and I love the way they look. I’ve decided to dedicate their use to weaving. I place the bowls next to the top support of the loom and measure out four good places, evenly spaced to place some cup hooks. I would use “eye” hooks, but all I have are cup hooks in a variety of sizes. I’m fairly certain I can turn them in a way that keeps the yarn from jumping off – if not I can buy some “eye”hooks the next time I’m at the hardware. I used a Sharpie to mark the placement of my hooks, and a drill to make a very small pilot hole to prevent splitting. I think it looks good; it doesn’t look like the small cup hooks will interfere with the looms weaving function. Now I just have to try it out, and I have 10 warps to prepare, so I’ll certainly get my use out of it. Lots of yarn is needed. The first thing I noticed is the yarn jumping out of the cup hooks. It was really annoying, but I would turn the hooks and give it another go. They would still jump out. My fix for this was a needle nose pliers. I gently squeezed the hooks nearly closed, and this completely solved the problem. After a few warps, I also placed the bowls on the bottom support of the loom; this didn’t do anything for the warping, but it looked a lot nicer and kept the bowls off the floor of the deck. 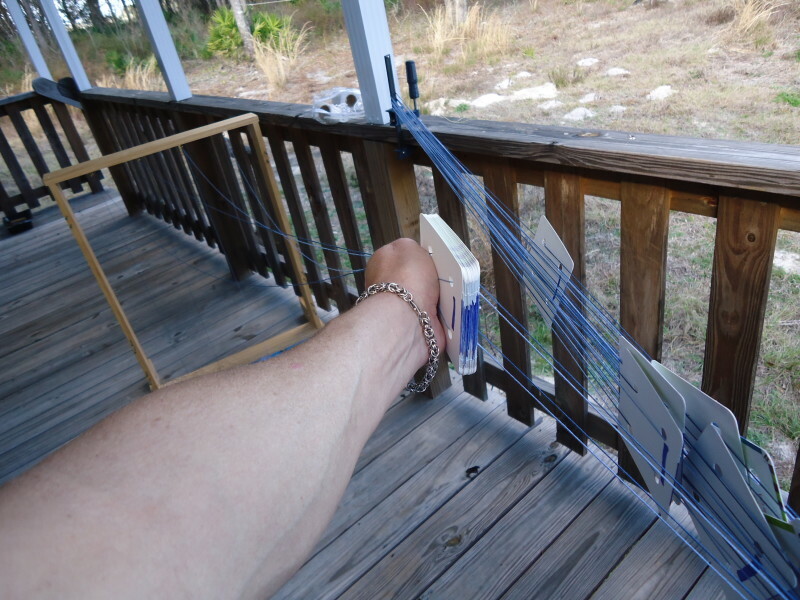 The deck is the best place for me to make warps for tablet weaving, but it was a very windy day and it put the warping rack to the test, but it passed. I use “C” clamps to wind my warp, and wish I had a table that I could attach the clamps to. 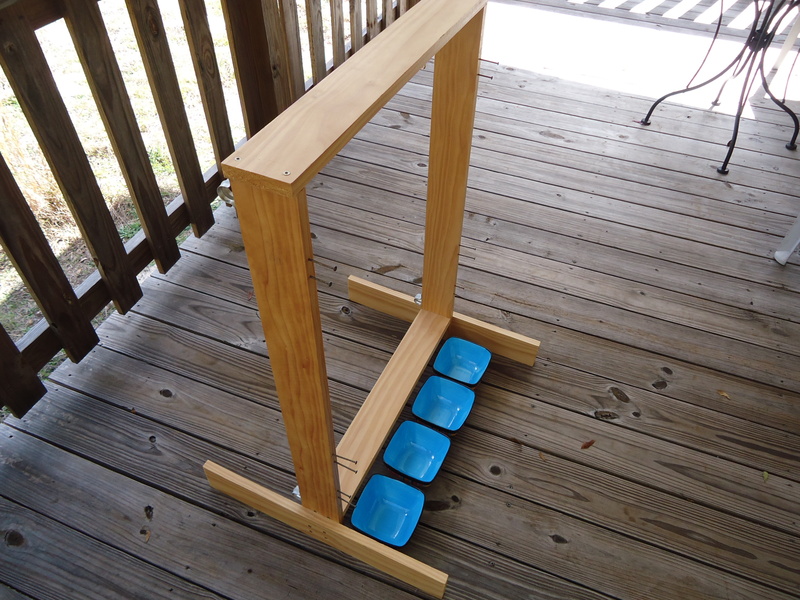 Those plastic tables just don’t work with “C” clamps. To further modify this loom into a warp rack, I could easily drill some holes through both side supports of the loom and run a dowel. 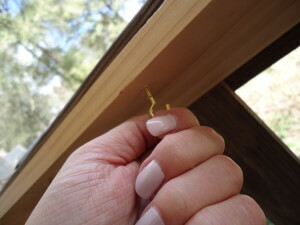 The dowel could pass through cones of yarn so the yarn would feed off from the side, which would avoid adding or removing twist from the yarn. I really wish I had thought of this sooner, it was such a help. I plan to take it with me to the workshop. Since we’re preparing a warp together it will be a lot easier for the participants when the yarn is feeding free and closer the height of our hands.